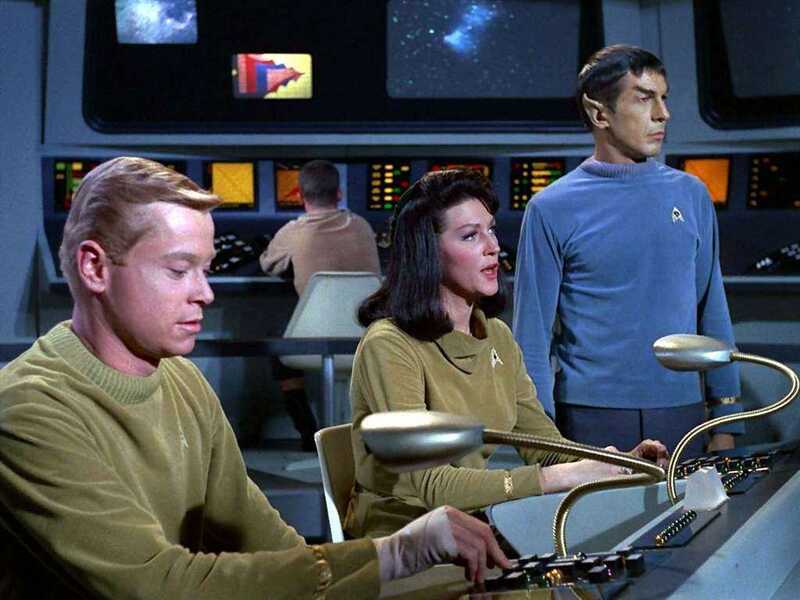 The visual look of the William E. Snyder, ASC's photography in the first Trek pilot, "The Cage," was noticeably different from the following series — with more muted hues. The fourth entry in our 12-part retrospective series documenting 50 years of production and post on the Star Trek franchise. 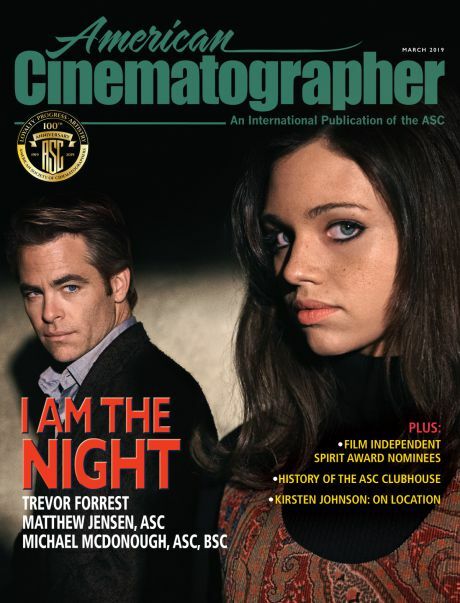 Cinematographers Gerald Perry Finnerman, ASC (Star Trek) and Marvin Rush, ASC (The Next Generation, Deep Space Nine) bridge television’s generation gap and discuss their experiences at the Final Frontier. 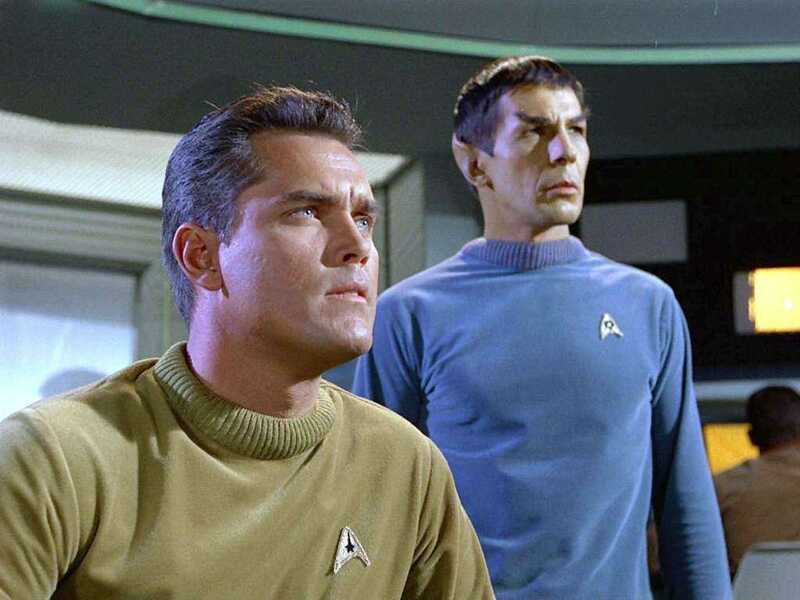 When the first Star Trek pilot was filmed 30 years ago in 1964, creator and executive producer Gene Roddenberry wanted Lloyd Bridges to play the role of Captain Christopher Pike, but the actor turned him down. Jeffrey Hunter subsequently played the role, but the pilot never aired in its original form. Network executives felt it was too cerebral, and that Spock was too satanic for the public taste. Overall, the Enterprise bridge also featured much cooler hues in "The Cage" — resembling the 1956 sci-fi film Forbidden Planet, a key inspiration. 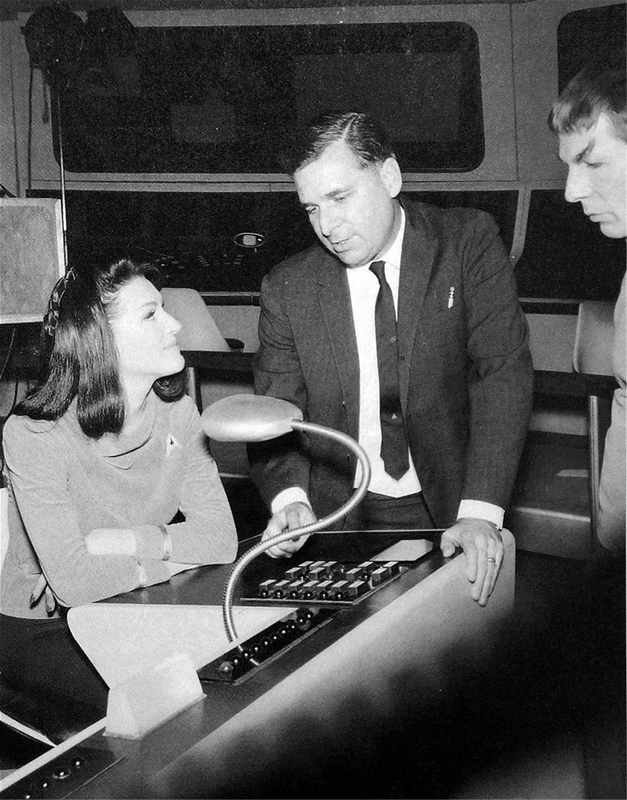 On the bridge set, Trek creator Gene Roddenberry is flanked by Majel Barrett and Leonard Nimoy while filming "The Cage." A second pilot, made in 1966, was to showcase Jack Lord in the captain’s role, but Roddenberry and Lord couldn’t come to an agreement. That opened the door for the inimitable William Shatner. Since Star Trek first aired on September 8, 1966, there have been three additional TV series, seven feature films (with the latest due next month), well over 100 books, multiple videocassettes and laserdiscs, in addition to endless streams of merchandise. 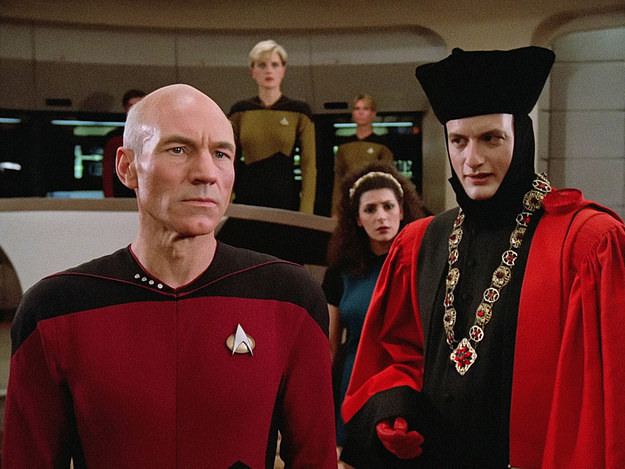 A poll several years ago indicated that 53 percent of Americans consider themselves Star Trek fans. In 1987, Paramount Communications redefined the television landscape when they bypassed the three main commercial networks and released Star Trek: The Next Generation in first-run syndication. A slew of other original programs and movies made for first-run syndication have followed in its wake. 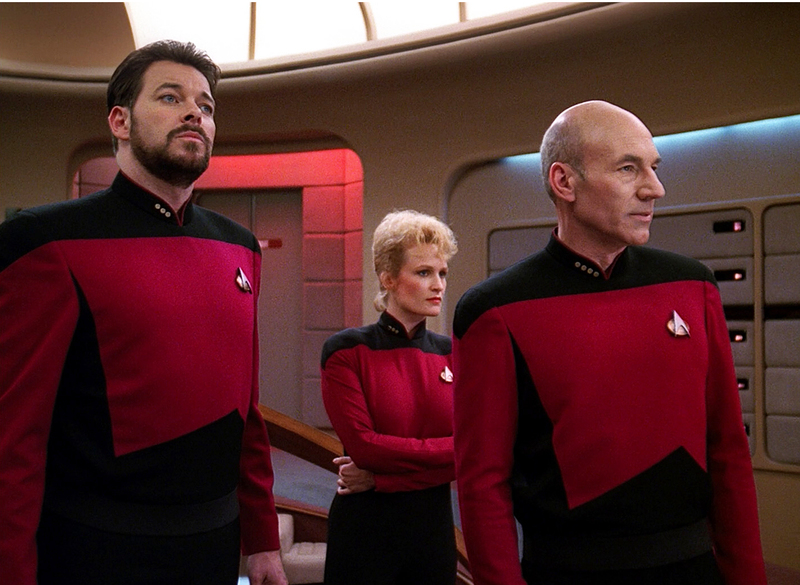 In many significant ways, Star Trek’s 28-year lifespan has encapsulated the contemporary history of television film. The original 1966 series was photographed by Gerald Perry Finnerman, ASC. Star Trek: The Next Generation was shot by Marvin Rush, ASC, who subsequently went on to shoot Deep Space Nine, and is currently filming Star Trek: Voyager. The two collaborated last year when the original Star Trek cinematographer filmed many of the background elements used for digital compositing of Deep Space Nine scenes. From the second Trek pilot, “Where No Man Has Gone Before,” photographed by Ernest Haller, ASC — featuring richer hues and red accents. 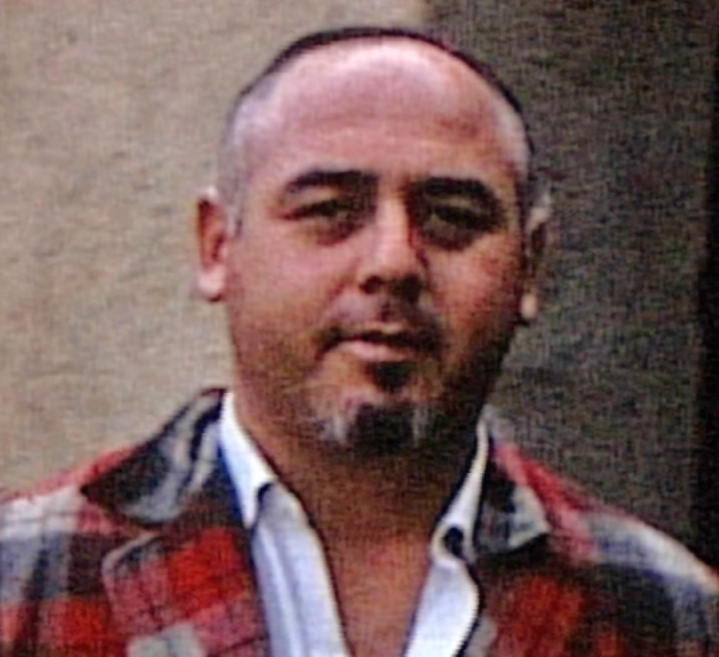 Gerald Perry Finnerman, ASC in 1967. Setting up a “planet exterior” — note the simple cyc background. Roddenberry told him to shoot a small test, and director Joe Sargent was equally encouraging. Finnerman wanted to put some 10Ks up high, and cut gels for different color themes. He planned to have scoops shooting light up from below, which would allow him to blend different colors. A colored light was aimed at the cyc, and costumed actors placed before it for the test shot. The filmmakers liked the results, and three days later, one of the heads of production at Desilu came onto the set with an $800-a-week contract. A frame from the 1966 series episode “The Corbomite Maneuver,” shot by Gerald Perry Finnerman, ASC. Subtle additions to the costumes and set — such as the black detailing — resulted in a more graphic feel. With that test shot Finnerman began to establish a Star Trek look. It wasn’t uncommon for him to use an 18mm lens, and occasionally a 9mm lens, to create a feeling of depth. More typically, he used 24mm and 28mm lenses. Finnerman recalls that he used 150 footcandles of keylights, which, combined with the authentically woollen costumes the actors wore in 1966, didn’t take long to overheat both makeup and actors. The situation was a Catch-22 for Finnerman. At f2.3, the images didn’t have the definition needed to maintain a feeling of depth: ideally, he needed a lens stop of f2.8 or 4. But that would have required raising the level of light to 200 to 300 footcandles, which would have had cast members fainting left and right. A classic eyesight effect used on William Shatner. Finnerman, who describes himself as “a knickknacker,” was not a fan of flat lighting, and on Star Trek, which was hot on relatively large sets with an ensemble cast, he used crosslight before it was in vogue. It was never as simple as putting up a 10K and using scrims to reduce intensity. He usually worked with two or three crosslights, precisely placed, while keeping the intensity as low as possible and giving the assistant cameraman enough of a stop to carry splits. Having been one himself, Finnerman understood what the assistant was up against. That’s one reason he used wide-angle lenses: if he had a 24mm or 28mm lens on the camera, Finnerman knew that the assistant had a fairly decent shot at carrying a split without causing either the foreground or background to go soft. That sort of technique was counterculture thinking for television production in 1966. Finnerman's 60 episodes include the fan faves “The City on the Edge of Forever” (above) and “The Devil in the Dark” (below). 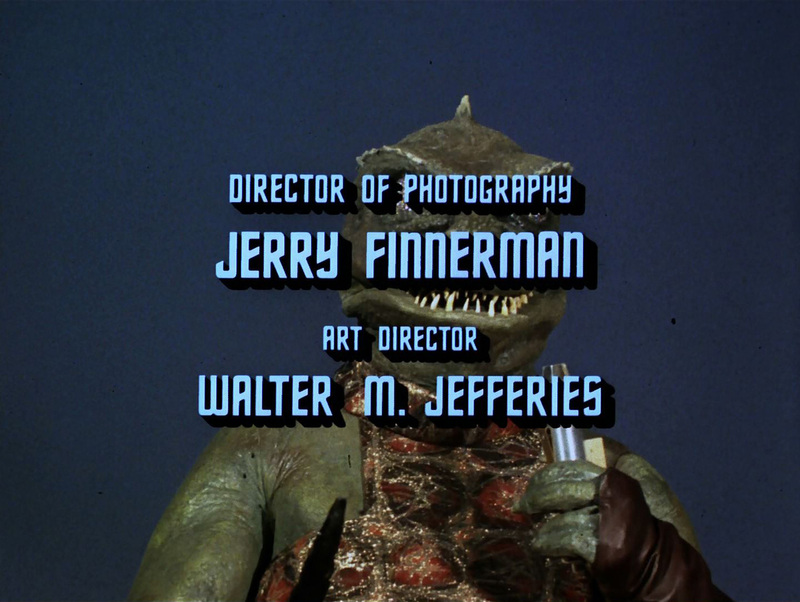 Star Trek, then as now, was filmed entirely on sets, and in the early days, Finnerman says, there was an amazing amount of jerryrigging. “We had wind and rain scenes, and would invent lightning effects,” he says. “We didn’t have a lightning machine in those days. I’d take an arc and reverse polarity. When you do that, every time you press the striker down you get flashing effect. I knew I was going to burn the arc up, and the electrical department would go crazy. But I thought it was worth it artistically. “Usually, when we did things like that, it was impromptu.” Originally, he recalls, the transporter room effects were to be done using dissolves. “The characters would just appear and disappear,” he says, “and I thought, ‘This is pretty insipid.’ What would be indigenous to this show was some type of lighting effect, so I had them drill three or four or five holes in the floor. We put lights underneath, and then I did the same on the top. “I had a lot to learn, and believe me, I learned every day. When we filmed our part of the two-hour Menagerie episode, I shot a whole day of process scenes, used as flashbacks. I shot it without putting the correction filter on the arc for the projection machine, and when I looked at it, it seemed a little cold. I couldn’t figure it out. What I hadn’t done was put a yellow carbon in the arc to correct for the Kelvin. Finnerman recalls, however, that Roddenberry turned to him at that moment and asked how he got such a marvelous effect! “I said, ‘I don’t want to go into the details.’ Sometimes you can look like a fool, but other times they think you’re some kind of genius,” Finnerman says. From the 1967 episode “Arena,” filmed on location at the famed Vasquez Rocks. Rush notes that the blessing and curse of Star Trek is that it can’t look like other television programs. “I’ve screened shows that Gerry shot in 1996, and compared them to other programs. It had a very distinctive, very different look, and it was better because of the difference,” Rush says. “The colors were wild. It was a snapshot of the times with a futuristic twist. I think for a lot of reasons it became an icon. One of them is the fact that the stories had a moralistic point of view. Examples of Finnerman’s bold use of color and lighting to add depth, interest and character to his sets. While Roddenberry was dealing with themes that were decades ahead of contemporary thinking, Finnerman was inventing new ways of shooting film for TV. Star Trek was one of the first shows with natural-looking source light, for which he caught a fair amount of flack from the network. He was told that his lighting should be flat and that the key-to-fill ratio should never be more than 2:1. Finnerman’s strongest influences were Burnett Guffey, ASC, an Academy Award-winner for Bonnie and Clyde and From Here to Eternity, and Stradling, whose Oscar-winning work on The Picture of Dorian Gray Finnerman especially admires. “Harry once told me, ‘When you take the lights around so far that it scares people, or it scares you, that’s when it looks good,’ and that’s what I used to do. I used to take that light way around until I got scared, and then it had dimension. 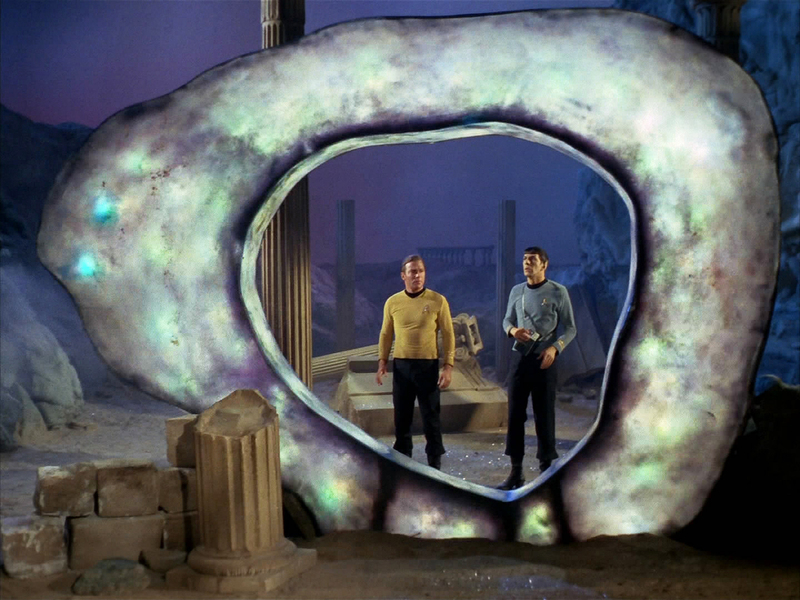 That’s what Star Trek had: dimension. It wasn’t only the colors and the gimmicks, and the shaking of the camera and the ship and the lighting, because basically we didn’t have a lot of effects, except for the standard wind machine and the rain machines. “I think much of the look also came from the placement of lights and the use of colored gels. We also saved the company a lot of money, since they didn’t have to paint sets to make them look different. We painted them with light. We changed walls from gray to blue to green, depending on the mood and what we wanted to say about that planet. One day we created a purple sky. Another day, the same set looked like a hot desert in March. A third day, it was deep blue. We did it with filters and lights. From the Next Generation pilot "Encounter at Farpoint," photographed by Edward R. Brown, ASC. In the early days, Finnerman shot with Mitchell cameras, which are big and heavy by today’s standards. But he always kept the cameras moving. “That’s another advantage of crosslighting,” he notes. “It throws shadows from sound booms off the set. We could make 90-degree turns in any direction. Actress Gates McFadden is prepped for a shot while shooting the sci-fi series Star Trek: The Next Generation (1987-’94). The long-running syndicated series was photographed by a stellar array of cinematographers, including ASC members Edward R. Brown, Marvin V. Rush and Jonathan West. Rush’s Star Trek voyage began when he was working at Paramount, shooting the sitcom Dear John. His only single-camera film credit was Frank’s Place, a critically acclaimed comedy series. Tim Reid, the star of that show, asked him to shoot a pilot for a one-hour drama called Snoops. Immediately afterwards, Rush was invited to interview for The Next Generation. Ed Brown, the original cinematographer, was leaving the show. Rush was interviewed by producers David Livingston and Rick Berman, both of whom were fans of the distinctive-looking Frank’s Place. Star Trek was, in more ways than one, a whole new universe for Rush. On Frank’s Place, he typically shot five pages per day. On The Next Generation, he was shooting eight to nine pages daily, and the workload included digital compositing and other effects, many of which were new to him. “I had done some minor optical work here and there, including split-screens,” Rush says. “I knew a little about bluescreen, but that was about it. I was starting with a new crew and producers I didn’t know. I’d known Hugh Wilson, the executive producer of Frank’s Place, for 10 years. When you know the producer and the crew, you have tremendous creative freedom. The streamlined, simplified look of the Enterprise bridge set designed for Next Generation suggested a clean lighting approach. “My philosophy of lighting is to look for the source,” says Rush. “I try to figure out where the light is coming from, and what the logic is. Usually it is obvious, unless you’re on a plane where there is more than one sun. George LaFontaine also taught me that when I shoot daylight exteriors on a soundstage I should put the sun in the worst possible place — the most unattractive, most uncomplimentary place — and then word hard to fix it. The idea is that when you are on location, you can’t put the sun where you want it to be. I don’t always follow that philosophy. But you don’t put it behind the camera – instead, I use a three-quarter raking backlight, or a half-light, or maybe even dead backlight, if you want it to look like real sunlight. Rush uses two approaches to designing light into sets. One is to put neutral density filters on them until they are nothing more than accent lights. The other is to allow them to become part of the base light. When an actor moves close to one of these lights, it is used as a source for motivating crosslight hidden just out of frame. Rush notes that the look of the bridge set for the Enterprise was fixed before he came onboard The Next Generation. Referring to Finnerman’s comments about the bridge set on the original show, Rush says, “They did the same thing on my show. They built a complete [muslin] dome over the set. There was no provision for any lighting other than the ambient light coming through the muslin. Putting lights beside the camera was totally unacceptable to me. Instead, we built some boards that could be clamped into the ceiling and created a lighting grid for the captain’s chair. “To my knowledge, the dome had never been photographed. It was supposed to be an observation window. You looked straight up and saw a star field on the other side. But no director ever made use of it; no actor ever looked at the stars through this window. We took the plastic window out and put a lighting grid in its place. It was very small. We didn’t call it an octagon, but it did exactly the same job. Rush is reminded of a sequence involving removable panels on the back wall of the bridge set, designed to allow the crew to take reverse shots of the cast. (The set also has permanent side panels.) For one episode, the director wanted to stage a shot in front of one of those panels, but Rush knew the camera would be unacceptably close to the actress. He didn’t want to use a 24mm lens for a close-up in this particular situation, because he knew the results would be inappropriate. But the director didn’t see it that way, so Rush asked his key grip to cut a hole in a panel wall to provide a better vantage point for the lens. 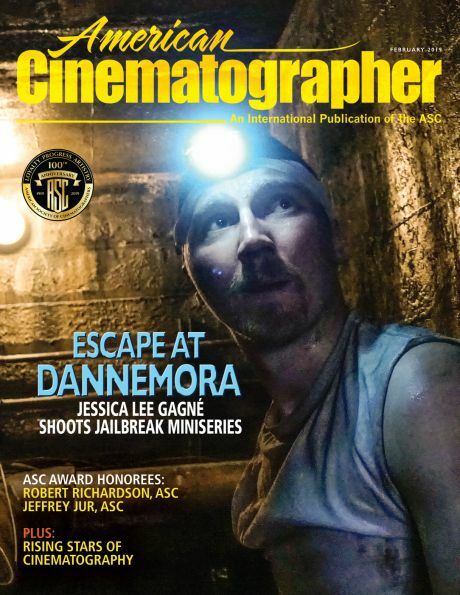 Rush, who had followed Finnerman’s work for years prior to meeting him, also cites Leonard South, ASC as a mentor. “I did Foley Square, my last show as an operator, with Lenny. He taught me a lot. I always prided myself on composition, but if an actor moved, I’d move the camera to correspond with his movement. 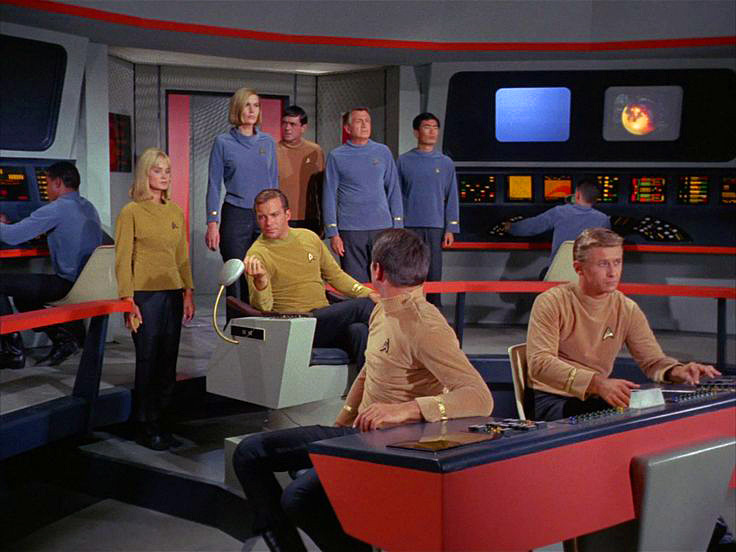 Rush notes that one of the original episodes of Star Trek might typically have incorporated eight or nine optical shots, a very ambitious number in the 1960s. A Deep Space Nine episode could contain 50 or 60 composites. The two-hour pilot had more than 200, including motion control filmed on stage with actors, and dozens of split-screens and digital composites. The producers also integrated morphing and computer-generated images into the show. Another major difference between the production of the two shows is dallies. When Finnerman was shooting Star Trek, dailies were on film, and they were only open to Finnerman, the producer and the director. The new Star Trek shows have open video dailies to which everyone is welcome. The only restriction is that everyone must watch the same TV monitor, in the same room, so that they see the same images. What hasn’t changed, Rush points out, is that the characters are wearing funny outfits, talking about places that don’t exist, and shooting silent guns that don’t have any recoil. There is a very fine line between creating a new reality and seeming silly, he says. “What’s happening in front of the camera must seem absolutely real to the audience. The people who speak the lines must absolutely believe what they say. They have to make the audience believe that there really is a place called Argon Nine, and that the characters have been there. “Whenever possible, sets are built in 360 degrees. There are no three- or four-wall sets. Instead, there are six-wall sets, including the floor and ceiling. Everything is shootable in any direction. If a director wants to do a 360-degree dolly, it’s no problem. He can show the audience the ceiling and the floor to help develop a sense of place.” The trick, Rush says, is to design the base light into the sets. That way, he doesn’t have to light every shot from black. As Finnerman had on the original show, Rush designed a signature look for key characters in the new Star Trek films. For example, Worf, the Klingon security chief played by Michael Dorn, has incredibly deep-set eyes. 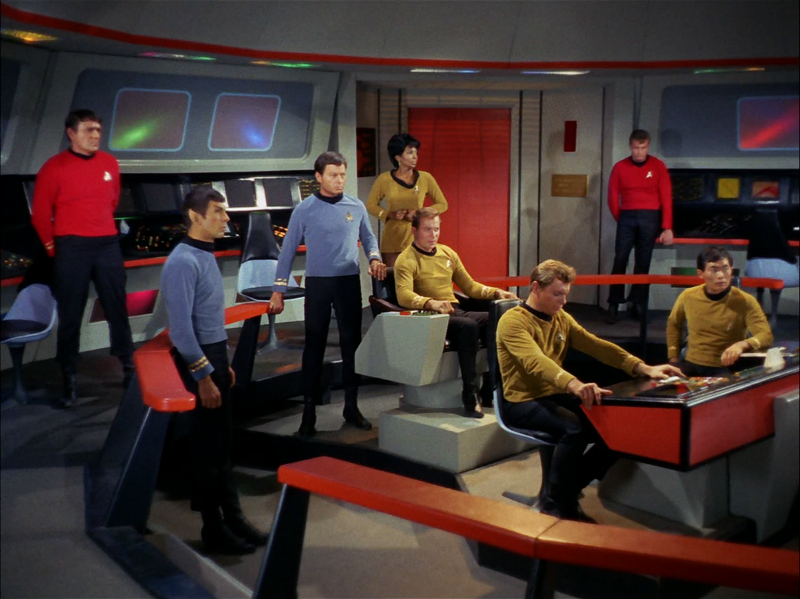 “Another Rush contribution to the look of the new shows Star Trek shows is darker set walls. He explains that if you have darker walls to begin with, they don’t tend to reflect as much of the bounce fill light he uses. This allows him to fill with ambient bounce light without using scrims and flags to tone down bright walls, which in itself creates more contrast. Rush says that he got lucky on Deep Space Nine: the cast had some difficult faces to photograph, but there were also many faces that can take light from a variety of angles and still look good. “The cast you work with, and their faces, determines to a large extent what you can and can’t do, certainly for close-ups. I usually give the actor something to look at when we are staging a scene. For example, if there’s dialogue, and we are coming for a close-up on one actor, I’ll ask the other one to lock in on the eyeline. I’ll show them where it is, and bang, they’ll come right to it. Ask Rush about the keylight level he used on Deep Space Nine last season, and he’ll tell you he doesn’t read footcandles very often. He thinks in terms of stops. He rates the 5296 at an exposure index of 400, about a quarter-stop overexposed. The lens stop is generally around T3 to 3.2. He estimates that his keylight is 30 to 35 footcandles. That provides some frame of reference when you compare it to the first Star Trek shows. Rush notes that the bounce light he tends to use requires more wattage, and one of his tricks to keep the stages cool is to use a tiny piece of foam core or show card stapled up in a corner. He puts an Inky on a pie plate, on a riser, and shoots the beam into the foam core. The result is sufficient to light a little corner of a set. “That option wasn’t available to you,” he says to Finnerman. “You simply couldn’t approach a little hidden corner the same way that I can. I can tuck lights into small little areas, and they do a lot of work. “Probably a lot of cameramen don’t use fluorescents as much as I do,” Rush continues. “We have rigged all kinds of fluorescents in various sizes, from tiny luminaries to big eight-footers. I also use quart light, and just about everything Mole Richardson makes. 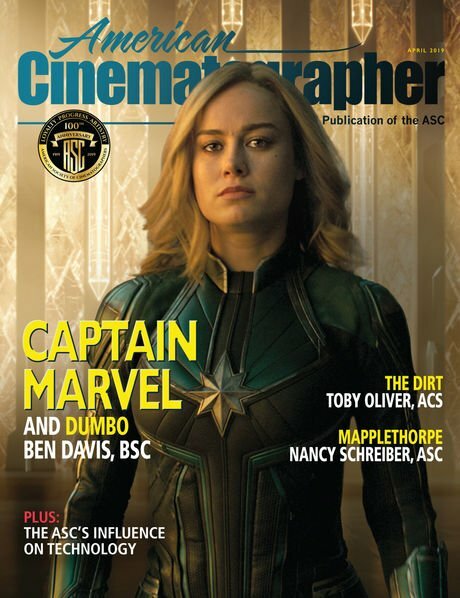 This story retains the original text and style as it was originally published in American Cinematographer, October, 1994.